I love how my hair looks curled. Especially since I cut it, wearing my hair in curls has been my favorite style to feel glam. My natural hair is curly/wavy, but it’s also frizzy and uneven— some curls are kinkier than others and it mostly just looks poofy. With that said, I’ve always had to actually go through the process of straightening before curling my hair to get it looking polished… so in the end, the entire process takes about an hour. Ain’t nobody got time for that! Luckily, I’ve discovered a tool that is basically my hair savior; you can officially call me obsessed. 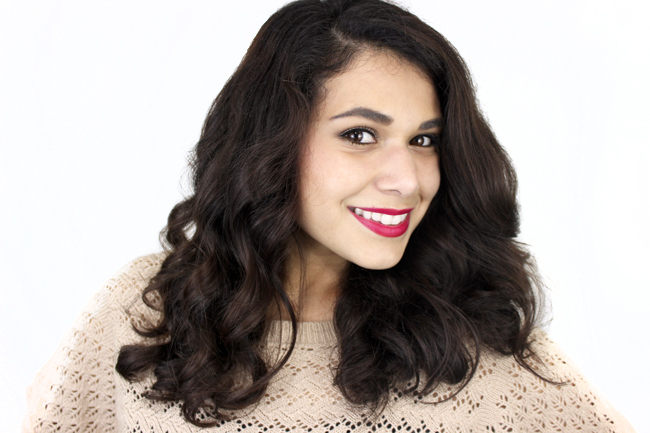 The Kiss Instawave is an automatic curler that makes curling hair so much easier for me. At the touch of a button, it twirls your hair around the barrel for you, evenly heating the curl for styles that last. It has two heat settings with a max temp of 420, so you can find a setting that works for your hair type. Keeping you hair on the barrel longer will make the curl more defined, while shorter hold times will create beachy waves. The coolest thing is that it works in both directions! This should be a no-brainer, but the Instawave is the first automatic curler I’ve found this feature on. As you can see, feeding my air-dried and frizzy hair is no problem for the diamond-ceramic Instawave barrel. This cuts down my curling time by more than half for fast and beautiful hairstyles. I very rarely experience tangles with this curler, and my hair actually feels smooth after it’s been styled. One feature that the Instawave doesn’t have is a beeping timer— I know some people will think this is a good thing because beeping can be annoying, but I actually like timers that let me know when to let the curl go. I’m usually curling my hair while watching YouTube videos, so I’m prone to zoning out and leaving my hair on the barrel too long. However, it does have an automatic shut off, and will power down after 90 minutes of inactivity. The Kiss Instawave is available for $60 in major retailers like Ulta and Target. It’s such an easy way to get curls and I have been using mine weekly. My old clamp curling iron has been collecting dust at the bottom of my drawer, and I’m pretty much ready to toss it. Have you tried an automatic curler that you’ve liked? your hair always looks great!! GORGEOUS!!! Your hair is incredible! Yes! It really shapes and smooths existing curls. Your hair looks amazing! I’ve been using this curler lately lately and loving it, too. Even took it to the trip with me this weekend, despite having to pack light. This is much cheaper than other wavers too, I need to check this out! Man, I hope I get Christmas money because I would LOVE to get this!!! This may make a difference, plus a little texturizing spray which I’ve recommended to other friends who say their hair has a hard time holding curls! It’s such a great all-in-one tool to smooth and style. I’ve been using the Umberto Dry Texture Spray, it’s great! Ooh your hair looks really nice with the curls. Like vavavoom!